Berry Wing has attended several One Million Cups events and we think they are valuable for any startup or entrepreneur! We have not only attended, we also presented one year ago and we were approved to present again, just last week. We noticed most presentations focused on "selling the product" of the company. When we presented this time, we did something different. We started by saying "Our goal is not to sell our product here today. We consider you in the audience our peers and want you to critique our business process." We covered our business process and literally showed a red pen, asking the audience to use it to provide the criticism we needed. We've taken a year to gather great experience, but our sales are lackluster. The feedback and questions were great! Most importantly, the networking and candid discussion time after the presentation hour was the most useful. Other presenters have said the same thing. While the Q&A portion of the presentation is somewhat useful, the time after the presentations offered better quality feedback and discussion. These "offline" conversations flow easier than the Q&A. Exchanging ideas becomes easier. It is up to us, the presenter to not challenge the ideas, but to listen and take notes. There is always valuable insight from an outsider. One Million Cups provides this. 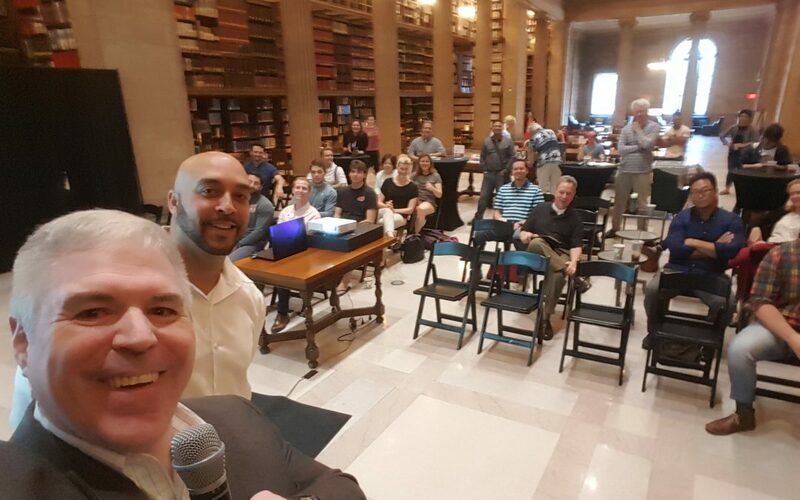 If you want to know more about One Million Cups, a Twin Cities PBS reporter attended the Saint Paul One Million Cups on Wednesday we presented and wrote an article, or check out the One Million Cups website.